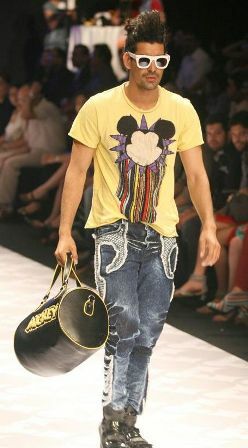 Today is the Final Day 5 at Lakme Fashion Week Summer/Resort 2012. All the five Days were breath taking in terms of designers and their collection. Now it’s the different scenario than old day fashion shows. Day by Day it seems that we are moving to more realistic collection by all Indian Designers. Designers are consciously making designs which can be wearing by us! Where as previously, fashion show collection were more unrealistic, dramatic and awkward to wear in public! Can we say that India is in the modern days of Fashion and Trend! At Day 2 at LFW 2012: Day 2 at lakme fashion Show started by Komal Sood & Pia Pauro. The Suhani Pittie, Payal Khandwala and Shift showcased their collection. It is noted that it was debut fashion show by Payal Khandwala. By profession she is a well known painter. On the same day Bhairavi Jaikishan, Priyadarshini Rao and Bibhu Mohapatra also showcased their collection. 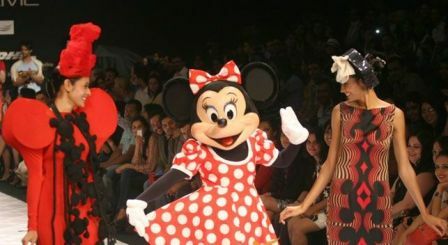 Littleshilpa & Nitin Bal Chauhan gave tribute Mickey Mouse & Minnie Mouse through their collection! Banerjee, Soumitra “Marg”, Deepika Govind, Krishna Mehta and Anita Dongre showcased their collection on 3rd day of Lakme Fashion Week Summer Resort 2012. 3rd day was Indian Taxtile day at Lakme Fashion Show. Prajwal and Bodice. The 2nd fashion Show at Day 4 was from Eina Ahluwali and Payal Singhal. Then Harangad Singh, Neha Agarwal, Rimi Nayak, Siddhartha Tytler, Swapnil Shinde and Narendra Kumar showcased their collection. “The Karmik Show” was big attraction of Day 4 at Lakme Fashion Week. At Day 5 at LFW 2012: Today is final Day 5 at lfw. So far Dozakh, Sougat Paul have already showcased their collection on ramp. While writing this post, MALAGA by Malini Agarwalla and Famous by Payal Kapoor is about to start at 1.30 p.m. Still Abhishek Dutta, Archana Kochhar, Arpan Vohra, Jatin Varma and show from Blenders Pride presents Rocky Star show is still to come. And the Grand Finale of Lakme Fashion Show is schedule at 9.pm, from none other than Rohit Bal. Who Else? Still many designers to showcased their collection. At Grand Finale Many bollywood and Page 3 cellebrities to come. Whole Media, Professional Bloggers are there to capture each momnet of Lakme Fashion Show. And We are here for You! 🙂 Always..
To give you all details about Lakme Fashion Week. Today is last day and we are proud to say that Whole five Day Myfashionvilla.com has covered LFW2012 throught Live Twitting and Blogging. More events and cool stuff is on the way! To stay updated follow @myfashonvilla on Twitter and facebook.com/myfashionvilla on Facebook. Take Care all Fashionista People..